Description: This theater built knife features a 10.25 inch double edged blade, 1.35 inches wide with a six inch long .25 inch wide fuller on each side. The cast aluminum hilt is slotted with the inset blade tang pinned in place with two brass rivets. Nine small brass studs hold the poured aluminum spacer that fills the slot. 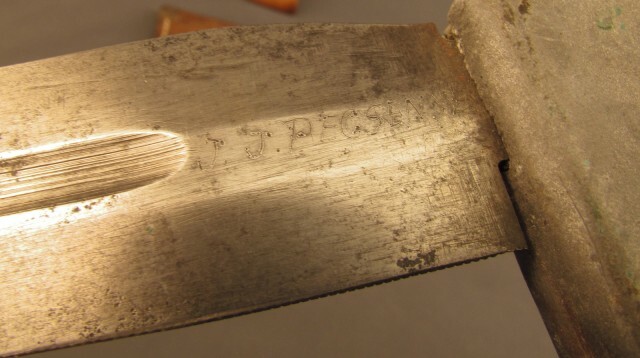 The blade is electric pencil marked near hilt "J.J. Pecsenye". Surprisingly, research has yielded two U.S. soldiers with that name! The first is John J. Pecsenye Jr., born 1918, from Lucas County Ohio. He enlisted April 7, 1942 at Fort Benjamin Harrison, Indiana, with US Army Serial number 35112471. He was an unmarried electrician. The second, was P.F.C. Joseph J. Pecsenye, originally from Michigan, who died in 1944 and is buried in the Netherlands American Cemetary and Memorial in Limburg, Netherlands. Further research could yield interesting results. 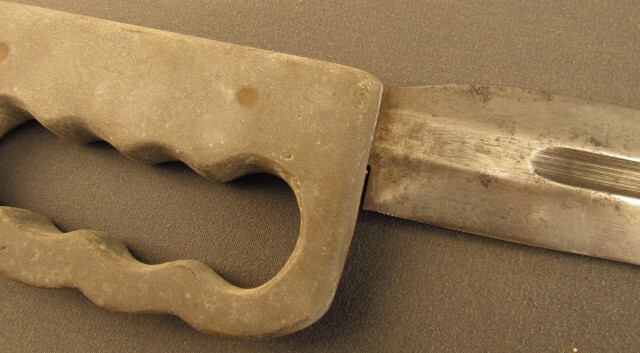 The blade is light grey with light sharpening scratches and scattered pinprick pitting. The hilt is covered in dark grey aluminum oxide with brass pins showing a nice aged patina. 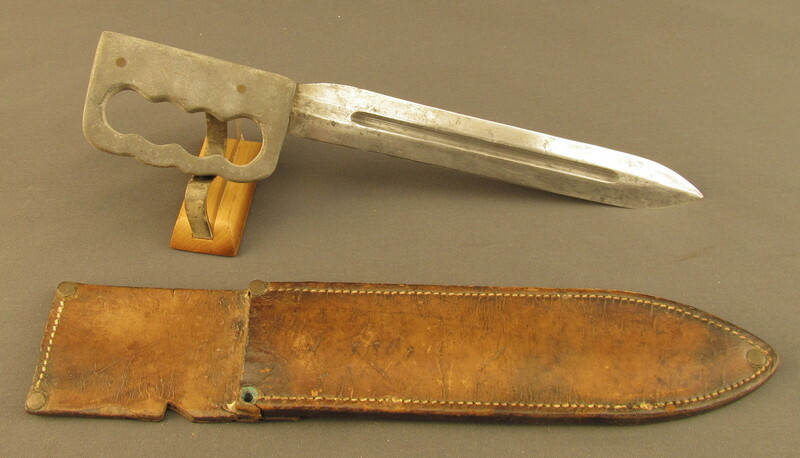 The heavy brown leather scabbard has some surface crazing, bottom of belt loop has pulled loose from the rivets, with several cuts in the loop. Scabbard is in very good condition with tight seams. 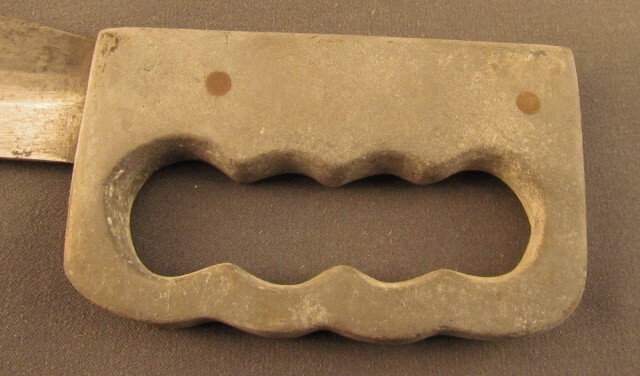 A very interesting and unique knuckle knife with room for more research. This piece is sold as a collector item only, please be aware of your own state and local laws.